Deputy Speaker Lindsay Hoyle raises his hands in helplessness as water splashes into the House of Commons, forcing an end to business Thursday. It was supposed to be a rare quiet afternoon for the House of Commons, a break from the chaos of Brexit. But as members of the U.K. Parliament discussed other issues, their chamber began to take on water, through a large leak in the ceiling. And with rainwater pouring in, business was canceled for the rest of Thursday. Members of Parliament gamely tried to speak over the sound of water echoing as it splashed into the gallery above them. But as they spoke, they often sneaked glances toward the ceiling, keeping an eye on the deluge while they discussed tax enforcement policies. "I want to finally finish my comments — with a leaky roof in the background," Member of Parliament Justine Greening said, smiling as she acknowledged the pouring water that had set off murmurs around the chamber during her remarks. 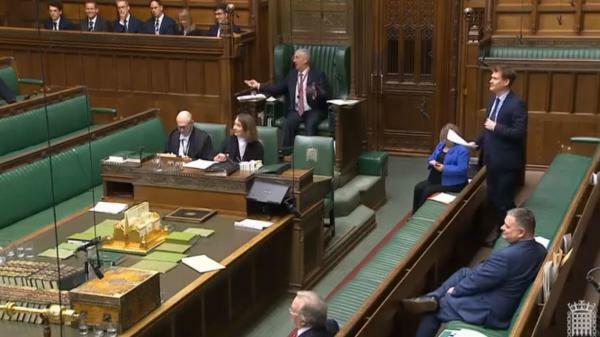 Greening and other lawmakers kept at it for some 10 minutes, their voices competing with the loud splattering sound of water, before one member interrupted a speech by Justin Madders of the Labour Party to point at the ceiling and ask if hot air was leaking from the room. "Somebody might say there's a leak in Parliament at the moment," replied Deputy Speaker Lindsay Hoyle. "I'm sure many Cabinet meetings have similar difficulties," Madders said. Madders said in a tweet, " Parliament really is broken." Soon after, Hoyle announced that Thursday's sitting of the House of Commons would come to an abrupt end. News that water was dumping into the chamber — the setting for tense standoffs with Prime Minister Theresa May over her Brexit withdrawal plan and a series of "meaningful votes" on the matter — set off jokes and wry comments online. In London, the Pimlico plumbing company offered to come out and take a look — but "only if MPs agree to revoke Article 50," a reference to the treaty language for voluntarily leaving the European Union. "Will there be indicative votes on how to resolve the matter?" asked Twitter user Tom McLaughlan, in response to the House of Commons' post about the stoppage. We would like to clarify this was not a sewage leak. Water from the leak fell into the press gallery area, just above the green benches where lawmakers sit. The House of Commons' press office says the leak "was urgently dealt with and has now been isolated." The office added, "We would like to clarify this was not a sewage leak." But that brought David Ponton's reply, "One doth protest too much."